This is one of the make and take cards my guests made at my Sale-a-bration and Summer Mini Catalogue launch party a couple of weeks ago. The design was entirely inspire by Teneale Williams here and I told my guests exactly that – and one of them confessed she had already seen Teneale’s card! 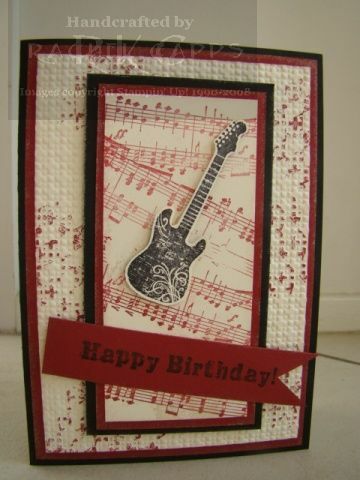 Teneale has made such a beautiful card, you should check it out (if you haven’t already seen it, lol!). 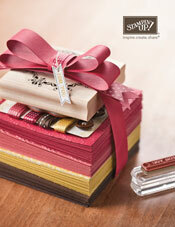 Only, I couldn’t use the stamp set, Bliss, as Teneale had. I don’t have it yet! So, this is a good example of how you can make what you have work for you. I wanted to also use Well Scripted on my launch night, so I made this card work for me. I used the colours Elegant Eggplant, Perfect Plum, Crumb Cake, Whisper White and Concord Crush DSP from the Level 1 Hostess DSP Pack. I put the Concord Crush DSP through my Big Shot with the Beautiful Wings Embosslits Die and a string of SU pearls in the middle. The striped DSP is also the Concord Crush DSP. Like Teneale, I also used the rock and roll technique for the damask from Friends 24-7. 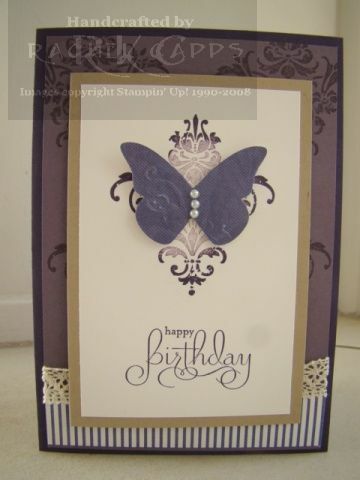 I stamped in Perfect Plum ink first, then stamped off once, then rock and rolled the stamp in Elegant Eggplant. I love the effect! I stamped the sentiment from Well Scripted in Elegant Eggplant and a touch of Victoria crochet trim lace finished off the card. This is the make-and-take card I used at a recent workshop. My hostess loves a vintage style, and she loved this card. 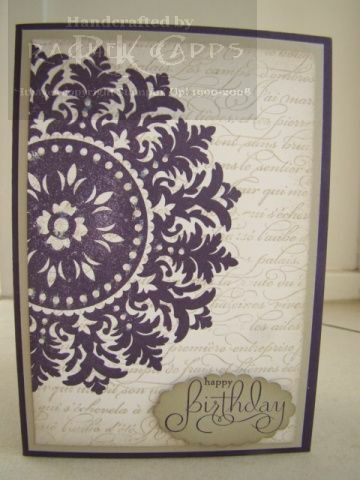 I used the colours Elegant Eggplant and Sahara Sand, sponging the edges of the Whisper White cardstock with Sahara Sand ink. I stamped En Francais in Sahara Sand ink first and stamped it on the Whisper White cardstock. After that I stamped the Medallion in Elegant Eggplant ink over the En Francais image. I then used my two-way glue and dabbed it in the circles of the Medallion – then dusting it with Dazzling Diamonds. The sentiment is from Well Scripted, available in the Summer Mini catalogue, and it’s stamped in Elegant Eggplant ink on Sahara Sand paper. The edges of the Scallop Oval are sponged in Sahara Sand ink as well. Simple, but elegant and antiquey! Here’s a take on the card below. Everything is the same, except one colour – Cherry Cobbler! Hmmm … masculine or not?